Poinsettias are added into this living wall during the holiday season. Living walls, also known as green walls, are vertical surfaces that are densely covered with vegetation. Planterra’s living walls offer a practical solution of adding greenery into buildings with tight areas or limited square footage. They provide the perfect focal point for reception areas, entrances or seating areas. Planterra’s practice is to match the client site with a living wall system that will work best for the space and the overall objectives of the project. Living walls can be achieved using a variety of methods and living wall systems, ranging from trailing ivy trellises to irrigated pre-grown planted panels. Systems where plants are rooted into a non-perishable material such as foam, synthetic fiber or rock-wool are the most durable panel-based systems available. This method is most applicable in large-scale commercial walls because it requires built-in irrigation systems, drainage and either natural light or artificial lighting supplements. Systems that use soil or organic growing media are separated into two categories: panel based and potted plant based. Panel systems are walls where plants are pre-grown into panels made from organic fibers. These panels can be very effective in creating a flourishing environment for plants and their roots. However, like all organic material, the media will erode over-time and re-planting will be required. Potted plant systems are structure that hold plants in either 4” or 6” grow-pots. 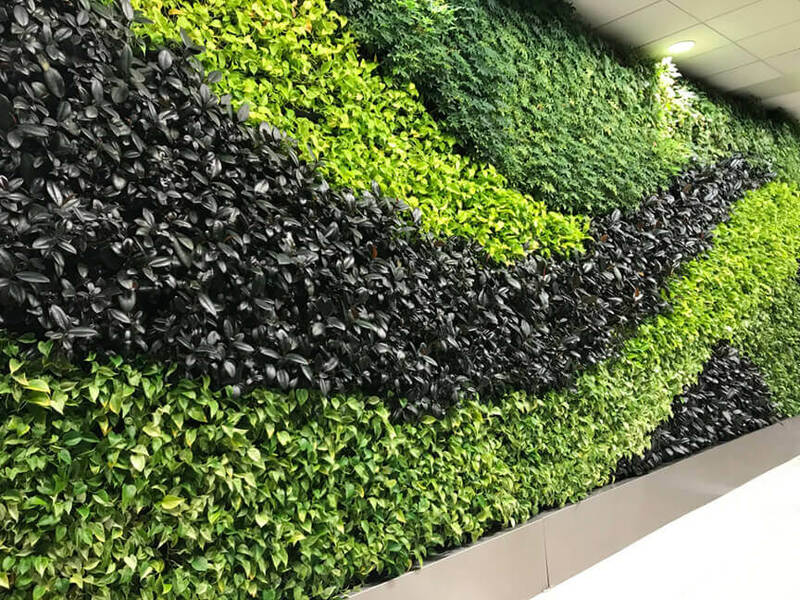 These systems are ideal for areas that require frequent and efficient rotations, such as living wall displays with flowering plants or areas with low-light. Most potted plant systems are pre-manufactured with water tight panels. Although the individual plants can be supplied in a soil-less growing media, the frequency of the plant rotations do not necessarily warrant this practice, as the plants will be exchanged before the media disintegrates and erodes overtime. These walls require the plants to be on a rotation or replacement schedule. Depending on the location and the size of the wall, this is often the most cost-effective technique to install and maintain a live green wall. If your installation doesn’t require an immediate green wall, a trellis system is a simple yet effective method which fills into a green wall overtime. The speed of growth is dependent on the plants selected, growing conditions and the compatibility of the trellis to the plant’s natural growth patterns. Some types of trellis systems can be purchased pre-grown with common plant ivies.